Heikin-Ashi Stochastic is a technical indicator, combined Heikin-Ashi and Stochastic calculations, to show price moving trend and reversal. The Heikin-Ashi technique – meaning "average bar" – can be used to spot trends and to predict future prices. Heikin-Ashi Candlesticks are based on price data from the current open-high-low-close, the current Heikin-Ashi values, and the prior Heikin-Ashi values. The stochastic oscillator is a momentum indicator used in technical analysis, to compare the closing price of a commodity to its price range over a given time span. 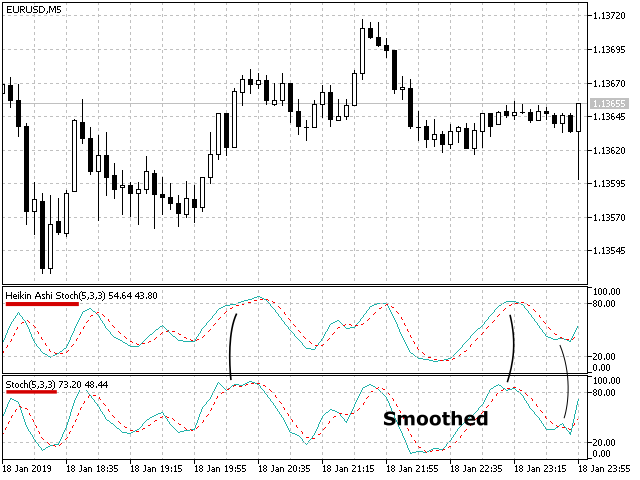 This indicator uses Heikin-Ashi Open/High/Low/Close prices to calculate Stochastic.